Students and faculty at Bloomberg in London. Check out more photos in the slideshow below. Point Park's International Media class traveled to London, Paris and Northern France to explore British and French media and culture, May 10-23. Professors Aimee-Marie Dorsten, Helen Fallon and David Fabilli went abroad with the group of 17 students. 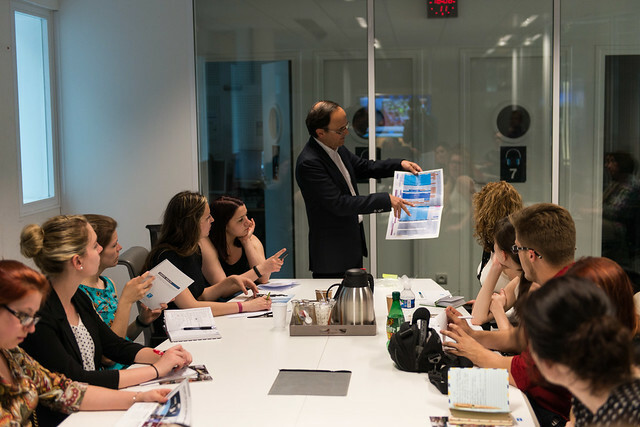 Media visits included Bloomberg London, Ketchum Paris, Agence France Presse, France 24, City University London, Birmingham City University and Disneyland Paris. The group also enjoyed cultural visits to the Latin Quarter, Notre Dame Cathedral, Basilica du Sacre Couer, the Eiffel Tower and a guided visit to the Normandy Invasion beaches during preparations for the 70th anniversary commemorations. "My favorite media experience was visiting France 24, the CNN of France. Our hosts were personable, funny and incredibly open and welcoming. They allowed us not only see how they work with one another under tight deadlines and controversial stories, but also how they produce the news." - Aimee-Marie Dorsten, Ph.D., assistant professor of journalism and mass communication. "This trip was a great alternative to studying abroad. I learned so much through both our cultural and professional visits. There was a great balance of activities, i.e. seeing the changing of the guards at Buckingham Palace and a moonlit boat cruise on the Seine River in Paris, as well as really interesting professional visits to The Guardian, Ketchum Paris and France 24." - Kim Roberts, public relations and advertising major. "One of my favorite media visits was to Agence France Presse, which is the French news agency. I learned so much from each individual that spoke to us. I found it interesting how the AFP use social media as one of its main ways to get stories out. I also learned about the different internship opportunities it offers, and is something I plan to consider." - Ty Smith, photojournalism major. "My favorite media visit was the social media roundtable in London because it was the most relevant to my career in public relations. Social media is such a hot topic in PR and advertising, so it was extremely beneficial to hear about the unique ways companies, brands and agencies are using it." - Melanie Vadney, mass communication major. "This course enabled me to travel to a new place, experience new ideas and cultures adding a fresh perspective to life; that's something every student should take advantage of." - Emily Kolek, M.A./M.B.A. student. "My favorite media visit was Disneyland Paris. I am absolutely fascinated with Disney from a business and entertainment management standpoint. I would definitely recommend this class and trip to a fellow student." - Samantha Crowe, sport, art and entertainment management major. "My favorite cultural visit was visiting Notre Dame Cathedral, it was absolutely incredible. The history and architecture of it was so overwhelming and perfectly created. It was so humbling to see it in person." - Emmiley Stern, public relations and advertising major. "We visited two major cities and media and communication centers, but we also sampled so much history in London, Paris and Normandy. That was the goal - to offer students a contrast and a chance to witness history, and we definitely succeeded." - Helen Fallon, professor of journalism and director of the Honors Program. To learn more about their trip, check out the student-created website for blogs, photos and videos.